Indian women’s hockey team is an embodiment of single-minded focus and mental strength. These 18 women who have played over 1,900 matches between themselves have enough to create a halo around the Asia Cup Champions. When India walked onto the pitch at London’s Lee Valley Hockey and Tennis Centre, venue of the 2018 World Cup, captain of the team Rani Rampal impressed upon her mates that England are Olympic Champions but “girls, we beat them at the Gold Coast and let’s try and do it again.”There are no short-term goals here. There is excitement and a sense of pride that the team is playing a World Cup, India’s seventh, and the players want to make it count.The goal was very clear, to focus on England. They knew, that if they lead to win or achieved a draw, they can get down to the USA and Ireland. It’s a tournament where teams like to take it one match at a time.And so it happened,India started their world cup campaign with a 1-1 draw against current world number 2 and world champions England in an enthralling encounter. Indian defence held resilience for a long part of the match but eventually succumbed to the relentless pressure of English attack. 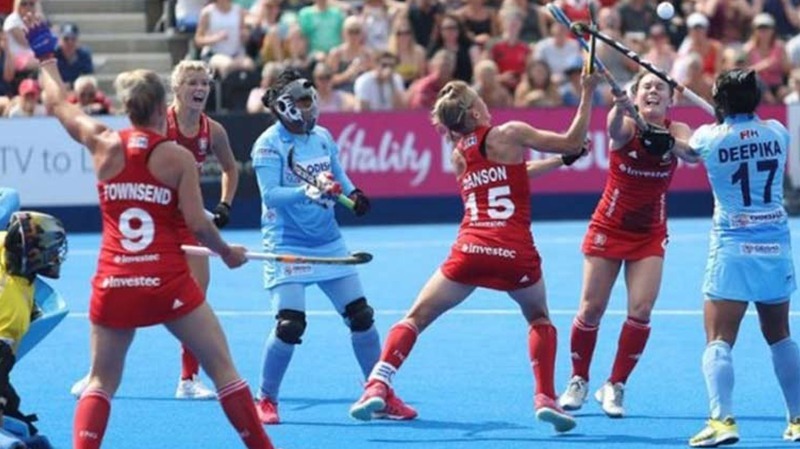 England who are also the hosts of the tournament were playing in a packed stadium and started brilliantly, winning a corner in the very first minute but the eventual drag flick was brilliantly saved by India’s goalkeeper Savita. England dominated most parts of the first quarter but Indian defence held firm and the plan of playing on the counter reaped fruits when Neha Goyal flicked Navjot’s firm shot into the net. England’s attack grew in numbers after India’s lead but a resolute defence saw them hold out the second and the third quarter. The English attack made an impressive 11 circle entries in the third quarter but could only take three shots thanks to some exceptional defending from India. Fatigue caught up with India in the fourth quarter where England displayed some impressive forward play and tested India’s defence on a number of occasions. Sunita made a brilliant clearance of the line in the 48th minute. India had a glorious chance to double their lead minutes later but Lalremsiami failed to deflect the ball goal bounds from Neha’s pass. England won back to back penalties in the 54th minute and scored of the later one to level the score. This draw could inject jet fuel into the players’ veins & help them gain much needed confidence about being capable of beating USA and Ireland and qualifying for the quarter-finals.Things have become tricky in Group B now where Ireland caused a stunning upset to beat USA 3-1 to move to the top of the group. India will be facing Ireland on July 26 in their next group game and then USA on July 29in their final group game. Doubt, confidence, fear, positivity and uncertainty are different skins that sportspersons wear. But deep down in the trenches unknown, it’s just the conviction to win that matters the most.And our women have it reflecting through their eyes.